This lobster, almost exactly half-red, was caught by an Owl's Head lobsterman and donated to the Gulf of Maine Research Institute in Portland by Ship to Shore Lobster Co.
PORTLAND, Maine — The lobstermen of Owls Head have seen some strangely colored crustaceans in recent years, but one pulled out of the ocean earlier this month was still a first. Mason said the lobsterman who caught the chromatically bisected crustacean about two weeks ago first brought it home to show his family, then agreed to let Ship to Shore donate it to the Gulf of Maine Research Institute in Portland, where it will live out its days alongside a blue lobster that Mason’s company passed along two years ago. 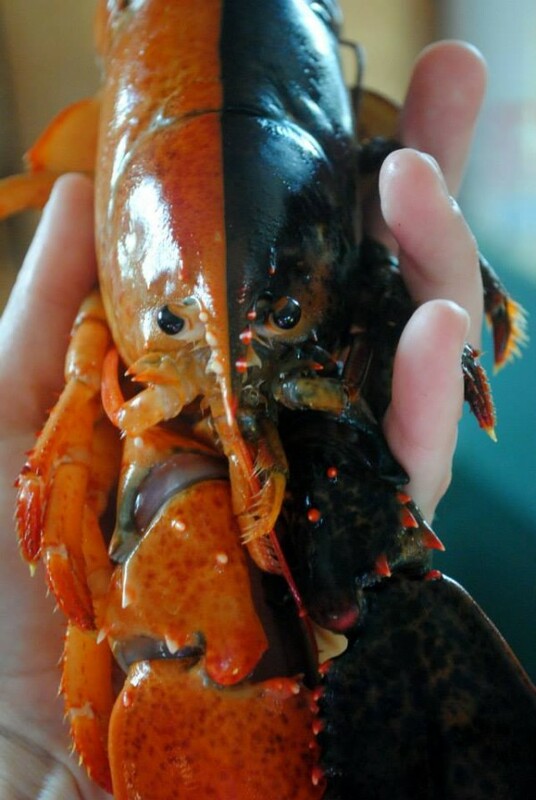 The institute reported this week when it accepted its new guest that split-colored lobsters are estimated to occur only once out of every 50 million or more. The rarest colored lobsters are believed to be white ones, which reportedly pop up once in every 100 million of the creatures, while blue ones and calico ones are comparatively more frequent — 1-in-2 million and 1-in-30 million, respectively, according to previously published reports. 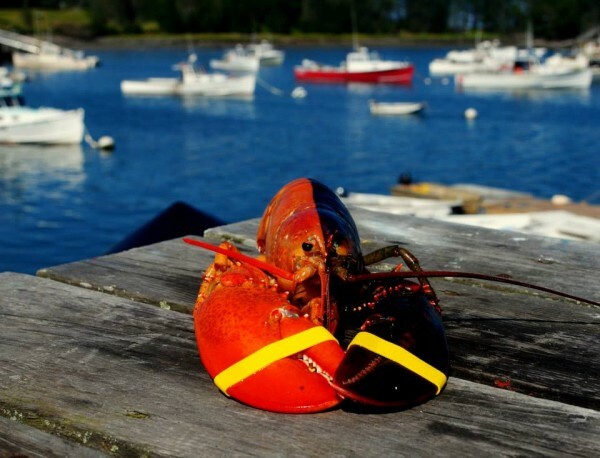 “It certainly is a rare thing [to find a discolored lobster], and when they catch them on a lobster boat, everybody stops what they’re doing and takes a look,” said Carl Wilson, state lobster biologist with the Department of Marine Resources. But, he added that the half-red variety of lobster is rare enough to be a first for him. “I’m the state’s head lobster researcher, and I have not seen a half-red, half-black lobster,” he said. Typical lobsters are a dark brownish green in color, and only turn red after being boiled for dinner. Stories of oddly colored lobsters have increased in recent years, but scientists have said they don’t know if that’s a sign the actual frequency of color variants has increased, or if the finds are just better publicized with the explosion of digital camera use and social media. Another possibility, a New England Aquarium official told the Associated Press last year, is that dramatic increases in the total catch — the statewide Maine haul reached a record 123.3 million pounds in 2012 — are bringing more of the unique lobsters to shore. In any case, the naturally half-red lobster delivered to Gulf of Maine Research Institute has been welcomed as an attraction and potential study specimen by its new owners.